For the regular readers of my blog, you know that in my previous life, long before I joined the blogging world, I worked at one of the biggest private hospitals in Manila. I was as one of the admitting officers in what we called the “Panic Room” because everyone who came in to the admissions department was either panicking or in a state of panic. And we couldn’t blame them because even if we were one of the biggest and most advanced hospitals back then, getting a room / or bed was almost as hard as finding a seat at the MRT during rush hour. There were patients coming in droves from the Emergency Room, expectant mothers who’ll tell you that their water just broke and are about to give birth, and others who come in from different hospitals. We were always at full capacity and it was hard to allocate the rooms for the Medical, Pediatric and OB patients. What’s even harder is trying to explain to the patient and their companions that we couldn’t just put them in any room as there were different wards for different kinds of illnesses. Or that we were still waiting for the outgoing patients to settle their bills, or that there was simply not going to be any available room for the rest of the day. Even if you had the money. Sometimes, patients would have to wait for as long as 5 to 6 hours. There was even a time, when a patient had to wait the entire day just to get a room. In my years of working in the admissions department, we would also have to deal with patients who were endorsed by public hospitals. The reason for this is either the lack of medical equipment like oxygen tanks, there were no specialization doctors for the patient re- diagnosis, some would need to be moved to the ICU or there were no NICU rooms available for babies. The recently approved Universal HealthCare Law authored by Senator JV Ejercito might not solve all the problems being faced by hospitals, but it would surely benefit every Filipino who is in dire need of access to proper health care coverage and services. 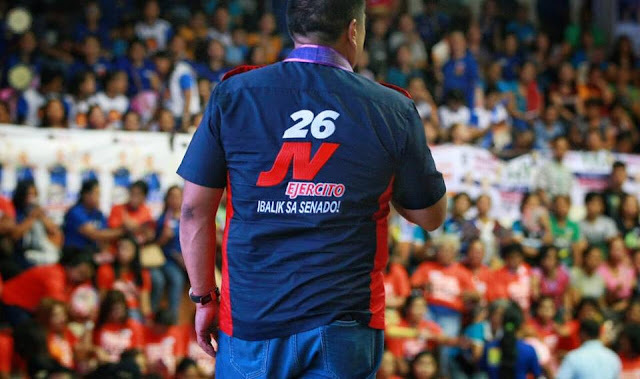 He considered the ratification of UHC as “a victory for all Filipinos and a sound accomplishment that truly reflects his commitment to uplift the condition of the people. “No Filipino will be left out because under the UHC, all Filipinos are covered under the national health insurance program,” said the senator. 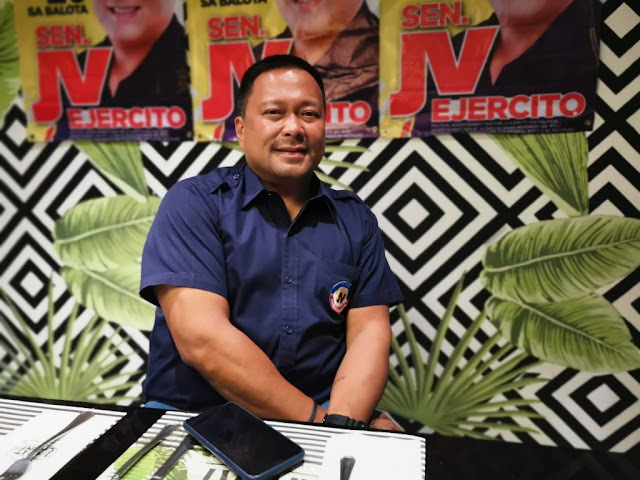 This was one of the reasons why Senator JV Ejercito has taken up the mantle of Mr. Healthcare as he seeks reelection in the senate. 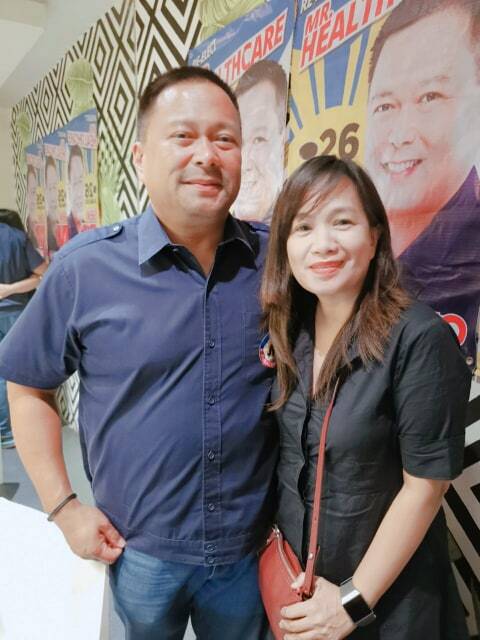 At a recent dinner he hosted for friends last March 28 at Lazat Restaurant in QC, he stressed that having the law signed by President Rodrigo Duterte was just the beginning of an even bigger challenge for him, and that is to make sure that the Universal Health Care Bill law will not just be a landmark law on paper, but something that will improve the lives of all Filipinos. The law automatically enrolls all Filipinos to the National Health Insurance Program (NHIP) and ensures all Filipinos are guaranteed equitable access to quality and affordable health goods and services and protection against financial risks. 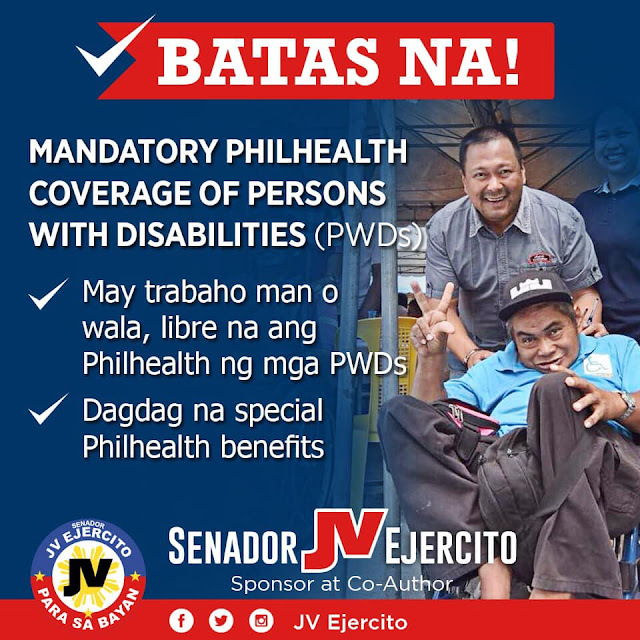 Under the measure, membership in the NHIP will be classified as “direct contributors” or those who have the capacity to pay premiums, or “indirect contributors” or those sponsored by the government such as indigents, senior citizens, and persons with disabilities. The law also grants every Filipino “immediate eligibility” and access to preventive, promotive, curative, rehabilitative, and palliative health services, delivered either as population-based or individual-based health services. 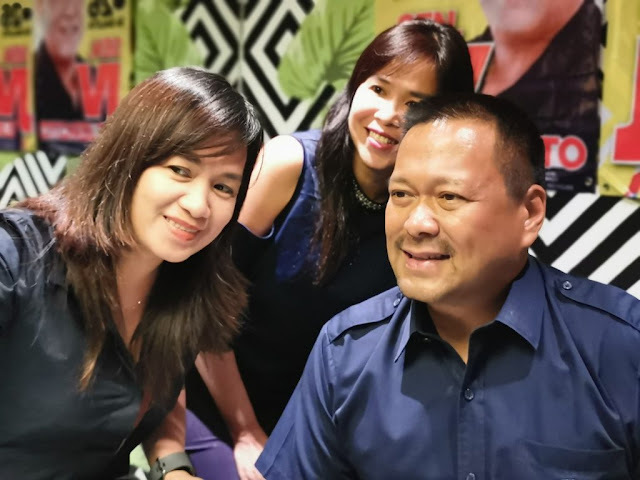 Senator JV Ejercito, adds that the law would expand PhilHealth coverage, which would include free medical checkups, laboratory tests, and other diagnostic services. All graduates of health-related courses who are recipients of government-funded scholarship programs will be required to serve for at least 3 years in the public sector, he said. Funds for public health coverage will be pooled from the incremental sin tax collections, charity fund from the Philippine Charity Sweepstakes Office (PCSO), income from the Philippine Amusement and Gaming Corporation (PAGCOR), premium contribution of members, annual appropriations of the Department of Health (DOH), and government subsidy to PhilHealth. As a lawmaker he has authored 41 ENACTED LAWS; 6 Bills Pending Signature And Approval By The President; 173 BILLS, 17th Congress; 40 RESOLUTIONS during the 17th Congress. 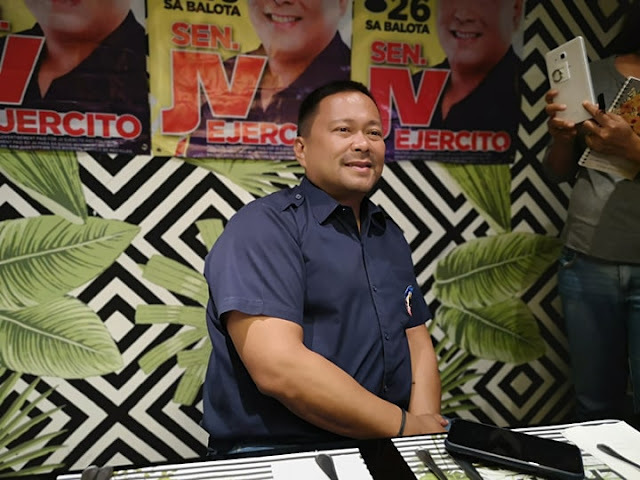 If Ejercito wins a second term, the senator adds he would also focus on creating laws to support infrastructure development and railway system. Infrastructure he said is key to furthering the development of the economy and the country. 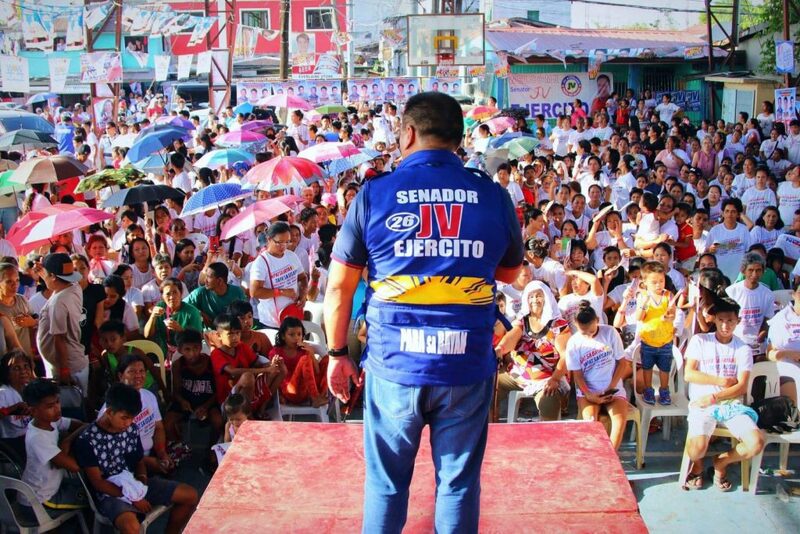 He again expressed his commitment to revive and improve the existing Railways both in the northern and southern parts of the country and has been very vocal about his vision of having a modern, efficient railway system for the country even when he was the Representative of San Juan City in the 15th Congress. “One of the reasons why I support President Duterte is because he is the only President in the recent years to commit and spend P3 trillion for infrastructures in the next six years. We have a growing population, now stands at 105 million; and 30,000 new vehicles are added to our streets every month- that’s around one million vehicles in the next three years. “We need to push for our railway projects, particularly the PNR-North, PNR- South, Mindanao railways system, and now the Metro Manila Subway System. The only way we can spread out development to the countryside and, at the same time, decongest Metro Manila, Cebu and Davao, is through infrastructure development and transport modernization. I think the Philippines is 30 years behind in terms of infrastructure development. We have a lot of catching up to do. Kung gusto natin ng tunay na hanapbuhay, if we want genuine exclusive growth, we really have to invest in infrastructure and transport modernization, Sen JV pointed out.